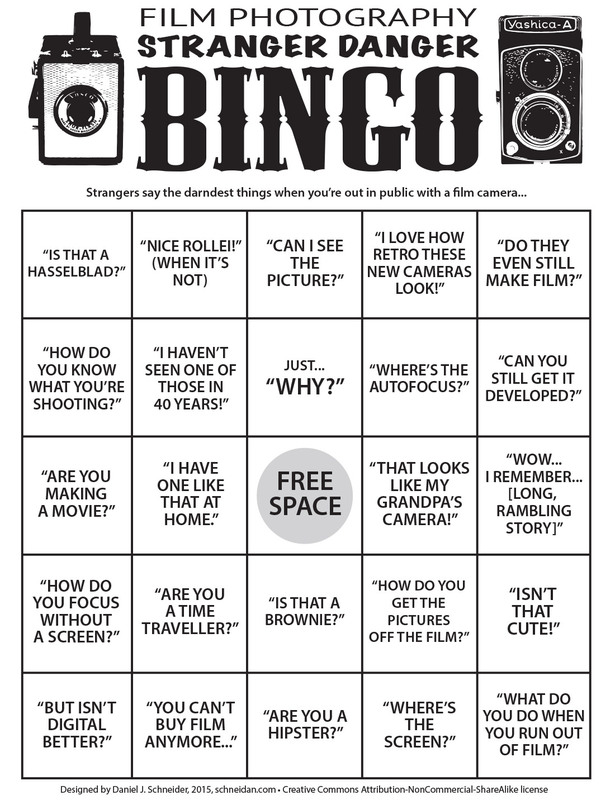 Just in time for the holidays, now you can enjoy a hearty game of Film Photography Stranger Danger Bingo, alone or with your friends. Inspired by the “Knitting in Public Bingo” game that appeared in my Facebook feed recently (no doubt via Kate or one of our fiber-fiending mutual friends), I put this little game together with some help from the #believeinfilm community. If you’re a film photographer, surely you’ve been out in public with your camera when someone has approached you with a confused or inquisitive look on their face. No doubt they asked if you were using film, what kind of camera you’ve got there, if you can even still buy film for that thing, and so on. Carrying a film camera in public is a great way to meet people — a great conversation starter. It can lead you to wonderful discussions of times gone by, even hours of inspiring first-person history lessons. But sometimes the questions and memories can turn almost to the point of ludicrousness as the uninformed masses try to impress you by knowing what a Linhof is, or that, even if you can get film there’s nowhere left to develop it. You’ve probably heard all these things and more, but now you can gamify the hilarity with this little bingo card I whipped up. You can even print out several (links to full sheet and 4-up versions below) and play with your friends, on a photo walk, or with a camera club. Assign some prizes and have a blast! Feel free to share this around, post it on your own site, or stick it on Facebook. Just please don’t do anything commercial with it, or use it without giving me credit and a link. Thanks in advance for that. Also, I couldn’t have compiled this fun game so quickly without the help, support and inspiration of all these great folks on Twitter: @takgyver01, @dsamaddar, @filmdevelop, @ZDP189, @OldSchoolLab, @essexcockney, @emulsivefilm, @falcos2012, @morrick, @marcvanommeren, @zen_bones, @EtudeImaging, @Moonsweetie, @cpindell1, @TobyVPhoto, @JohnnyPatience, @ClickErik, @codypriebe, @ThunkinOutloud, @taylorbright, @mybluephase, @Filmtographer, @tmway84, @miiamapps, @GIGACHURCH, @BillMcCarroll, @edwardconde_, @pkannofisbump, @tiefengeist, @richkleinphoto, @MrHolga, @Alan_Brock, and @bijan.